After five years support, we’re almost ready to stand back from the Taste of Fethiye project in Turkey. The project is now on the verge of being handed over to local organisations. FETAV (Fethiye Tourism, Education, Environment and Culture Promotion) have already taken over organisation of the Taste of Fethiye Craft Fairs, and we’re busy working on agreeing responsibilities that will be handed over to local organisations who will continue to run the Taste of Fethiye brand in future. The wholesalers that were involved in the project from the beginning are still working with almost all the Taste of Fethiye farmers, which is hugely important to ensure future success. We also had a great increase in involvement from hotels last year, which had a great influence on production and sales. 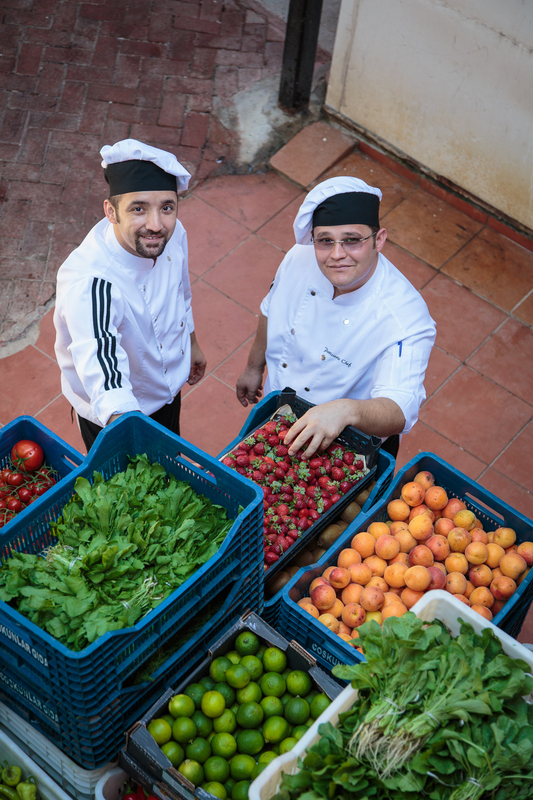 Fifteen hotels are still purchasing Taste of Fethiye produce, which tells us after all these years of hard work, purchasing local fresh fruit and vegetables from Taste of Fethiye has become a part of their day-to-day business practice. So, it seems that it IS possible to integrate small, local suppliers into the mainstream tourism supply chain. Myself and Vicky are currently working on an impact assessment report for the project, and I look forward to sharing all that stats with you soon. Read more about the Taste of Fethiye project. What’SUP with our Blue Wave project? The Blue Wave Project takes place in the Fethiye-Gocek Special Environmental Protection Area located in southwest Turkish Mediterranean coast. A working group consisting of cross sector representation from all the stakeholders (marinas, bays, private boat operators, NGOs, local authorities) Chamber of Shipping, TURMEPA – environmental NGO, D-Marin- a private marina group and the Travel Foundation are responsible for delivering the project and co-ordinating activities. The project aims to improve the level of sustainable practices carried out within the sector and amongst tourists, creating a cleaner and more appealing tourism product. Around the coast there are around 40 bays or islands that visitors can enjoy. One of the main reasons why tourists visit is to enjoy the beautiful marine environment, with most tourists taking a least one boat trip during their stay. However, the increasing popularity of marine recreation threatens to destroy the very thing that supports the economy of the region – the environment. Last week I went on a four day solo stand-up paddling (SUP) board tour around Fethiye-Gocek bays and Islands. This was the first time that a person was making a multi-day SUP excursion around that coast, and the idea was to spread the word about the Blue Wave Project to tourist boats and establishments on bays and islands. I paddled about 30 miles; talking to tourists, boat operators and restaurant owners on the way, while demonstrating one of the lowest impact ways of sea travel. People were mostly interested in how I was able to carry all I would need including the food that would last four days on a paddleboard. This is one of the ways to demonstrate how minimalist you should think while sailing or traveling with a motor boat. You are there with hundreds of other species sharing the same environment, and being solo and interacting with all that marine and land wildlife made me feel like a real outsider. Read more about Blue Wave. I am particularly excited about Blue Wave, which aims to improve sustainable boating practice in the Muğla region. This part of Turkey is well known for its pristine coastline, but is experiencing increasing demand on its marinas and bays. With a high level of engagement and support from local stakeholders – private, public and the municipalities – Blue Wave is bringing together stakeholders with the shared goal of strengthening sustainable marine practices. This will include work such as training for staff, information for tourists, sustainable action plans for bays and so on. The project is contributing to the development of Fethiye as a sustainable tourism destination, while also building on the Taste of Fethiye project, which increased the benefits farmers gain from tourism and encouraged good farming practices. of Fethiye farmers by sourcing the fruit and vegetables for one of its tours from them. This can only encourage other stakeholders to follow suit. Although strengthening sustainability can take time, local stakeholders in Fethiye are actively collaborating, sharing and implementing best practices. Could we ask for more? Taste of Fethiye Project coordinator Semsi Toprak recently held a break-out session in the Ecotourism and Sustainable Tourism Conference North America (ESTCNA), the first major sustainable tourism conference following the adoption of the United Nations Sustainability Goals and the outcomes of COP 21 Climate Change negotiations. The conference was organised by The International Ecotourism Society and hosted by the University of South Florida Patel College of Global Sustainability. The theme for this year’s conference was ‘Transforming Our World Through Sustainable Solutions’. I can’t tell you how good it was to be able to speak about the project that far from home. Seeing the interest – and even surprise – on people’s faces was worth the trip. Semsi’s session took place within the ‘Sustainable Food’ theme and was well attended by an international group consisting of tourism professionals, travel writers, private companies and academics. It was amazing to see the audience’s interest. One question followed another, until at last we got a nod from the moderator to end the session. Once again I was very proud to be part of this unique project, which presents an ideal example for the tourism industry. Since 2010, our Taste of Fethiye project in Turkey has been working to increase the benefits farmers in gain from tourism, and encourage good farming practise. Having successfully increased produce yields, the project looked to assist farmers with the sale of produce to hoteliers, and other businesses, through a wholesaler under the ‘Taste of Fethiye’ brand. Now in it’s final year of Travel Foundation funding, project stakeholders have significantly begun to step-up activities in preparation for ownership after 2015. Having seen the value in fresh, local produce, the wholesaler (through which the ToF produce is sold) has produced its own marketing materials for ToF branded fruit and vegetables. This includes printed materials such as letterheads and purchase agreements, and new van livery that includes the ToF logo. This is a really positive step towards self-sufficiency. “We have been working with the Taste of Fethiye project for 4 years and we are very happy with the progress. After all these years we feel ourselves as a big family with farmers, project manager and hoteliers. We are receiving quality products from the farmers and delivering them to hotels as fresh as possible. We see the increasing interest from the hoteliers too. Every year we are increasing our sales with new hotel agreements. As the company owner I always thought that we are very much lacking in marketing and communication. With the help of Taste of Fethiye project we feel that we’ve improved our communication and marketing skills. With the story behind and successful improvements through the years, this project gives us the tremendous opportunity to communicate more with our customers. 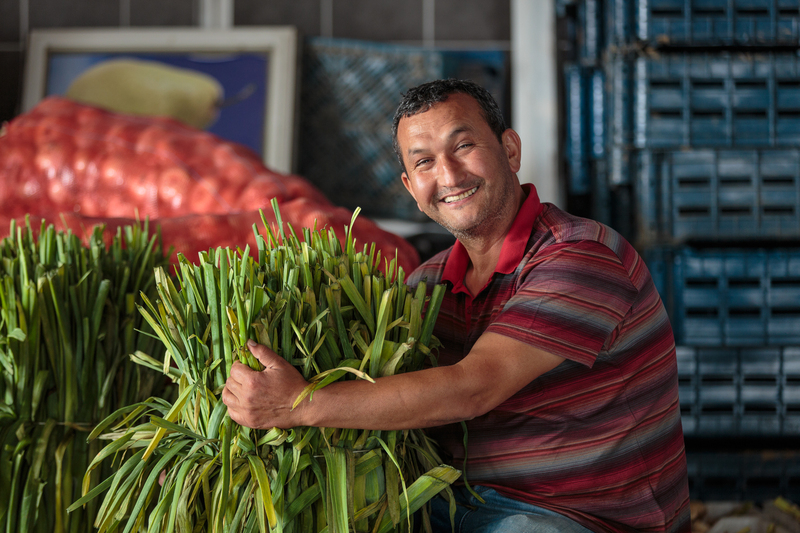 The ToF project has been working with 29 farmers throughout 6 villages, who are now supplying produce (via the wholesaler) to hotels and businesses throughout the Fethiye region. To read more on this project, click here. 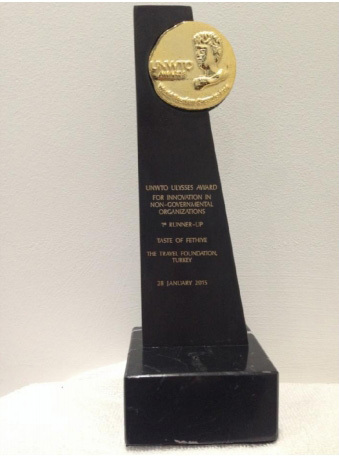 At the 11th UNWTO Awards for Excellence and Innovation in Tourism on January 28th, the Taste of Fethiye project was 1st runner up in the UNWTO Ulysses Award for Innovation in Non-Governmental Organizations category. This a huge achievement, especially given the tough competition, and celebrates the work that has taken place since the projects inception in 2010. Vicky Erdogan and Semsi Toprak, from the project team based in Turkey, attended the awards ceremony in Madrid. You can see some pictures from the awards ceremony here, and read about the winners of each category here.